Versalift are the world’s largest vehicle mounted platform manufacturer with over 95,000 units sold since 1965. We have over 50 years of experience in the design and manufacture of premium quality access equipment. Versalift UK alone has sold over 7000 units since its formation in 1994 and today holds a market share of almost 90%. Versalift UK is part of the Time Manufacturing Company which was acquired by the American private equity firm The Sterling Group in 2017. We are a sister company to Versalift Denmark and Versalift France and together are committed to providing first class after sales support to our European customers. 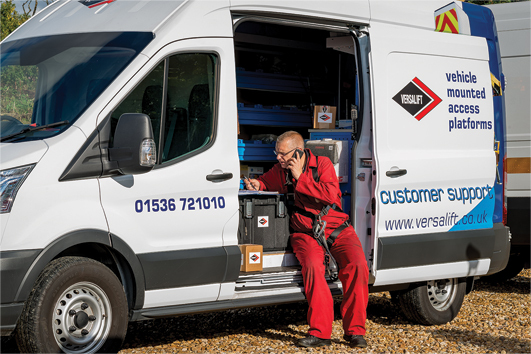 In 2019, Versalift UK celebrates 25 years as market leader and has sold and supported over 7000 units in the UK and Ireland. As market leaders we provide customers with innovative products for real life working at height solutions. Our reputation for industry ‘firsts’ enables Versalift to work with many of the UK’s major telecom companies, utilities and major contractors in both the private and public sectors. With the infrastructure to support over 7000 Versalift machines in the UK and Ireland, we offer the highest level of service and support to each unit throughout its life. With global backing and extensive production and workshop facilities, Versalift leads the field.